"Many customers are uneasy with the current status-quo," Front Porch CEO Zach Britton told us. "Our challenge, as an industry, is to communicate what is, and isn't transpiring. If successful, we will show that ISP-based behavioral targeting offers greater benefits and is less privacy invasive than typical Google searches. If not, the industry will be stillborn." If these companies steer clear of personally identifiable information - and they insist they do - their services are perfectly legal in US. But, says Ari Schwartz, chief operating officer of the Center for Democracy and Technology, the services may be "pushing the boundaries of what consumers expect". It all depends on whether these companies - and their ISP partners - are open about what they're doing. "[These firms] are going to say they're not transferring any personal information, and all the US laws are based on personal information," Schwartz told us. "But there are some questions as to whether they're properly notifying people. "There has to be an unavoidable notice for consumers," he continued. "We think that burying the information in the terms of service is clearly not enough." And he would prefer that these companies use an opt-in model - rather than an opt-out. Like NebuAd, Front Porch insists that it properly notifies ISP customers. In the US, it has deployed its service on both residential ISPs and wireless hotspots. On the residential side, it says that users are notified via its very own browser-based "messaging system." "We mandate that all our ISP partners ensure that 100 per cent of users understand what's going on and, secondly, that 100 per cent of users get the choice about whether they want to participate or not." 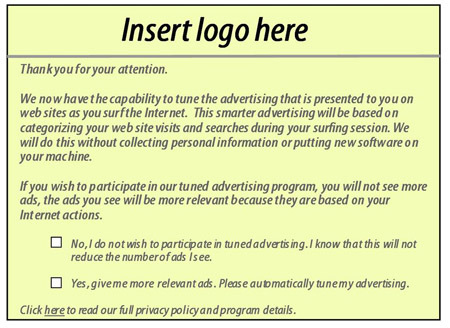 Supplied by the company, this is a generic version of the screen - with 'insert logo here' used to indicate where the name of the participating ISP is posted. When it appears in a browser, users can bypass the screen by clicking on a link just above it, but the company says that if a user doesn't check 'yes' or 'no,' the screen will reappear at a later time. Britton does acknowledge that the language on this screen changes from time to time - the 'yes' and the 'no' boxes might be reversed, for instance - but he insists that every user sees a screen like this. On the hotspot side, things work a bit differently. The messaging service is not used. Instead, users are only notified from a lengthy terms of service that appears when they sign up - and there's no opt-out. "If you're traveling through one of our airports or hotel chains or whatever, and it's offering free internet access, in that first page there's a clear part that says we will give you targeted advertising while you're on this network. "This is a free service, so if you don't want targeted advertising, you just say no to the free access." Meanwhile, NebuAd sent us a copy of its standard contract, where ISPs are required to "directly" notify customers. But Knology seems to contradict the company's definition of "directly." And although other ISPs, including WOW! and the Kansas-based Embarq, have added language to their terms of service indicating they're using a service like NebuAd's, it's unclear if they provide more direct notification.